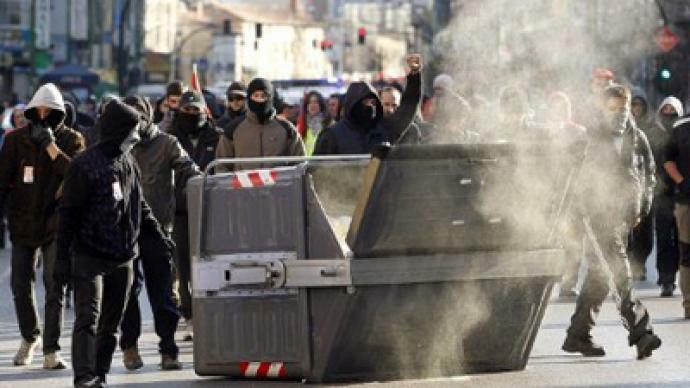 At least 58 people have been arrested and nine injured in Spain, as thousands take part in a general strike and rally against recent labor reforms. Flag-waving protesters fear the decree will undo employers’ hands and thus rob them of their rights. The 24-hour general strike began before dawn, along with pickets and sporadic clashes with police. Most of those arrested were detained in the early hours, after trying to stop night shift workers getting to their jobs on public transport, in factories and in wholesale markets. Demonstrators burnt mattresses, tires and other debris in an attempt to keep workers from their jobs. A Molotov cocktail was even thrown at a police car in the eastern city of Murcia. The car was destroyed and two officers were injured by the flames. Hundreds of flights were cancelled, several local TV stations went off air, and several factories shut down for the day, including the Nissan and Seat facilities in Catalonia. Hospitals provided only minimal care, while at least a third of public transport was halted. Major demos took part later in the day, with some protests joined by those who had finished work. Initially unions claimed over 250,000 people would join the strike and demonstrations in more than 100 towns and cities across the country. 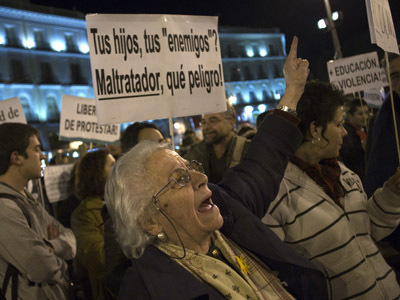 "They want to end labor and social rights and finish off everything," is the theme of Thursday’s protest in Spain. Later, unions claimed that 85% of workers had joined the strike. There were no reports of serious violence during the demonstrations aside from street fires in Madrid and Barcelona, where roads into the city were blocked. There are also reports that in Barcelona, demonstrators broke windows and lit a bonfire outside the Barcelona Stock Exchange. Several arrests have reportedly been made. The anger was triggered by a recent labor decree, approved last month as a law taking immediate effect. The Cabinet says the updated legislation will bring flexibility to the workplace and simplify rules for employers. “For the health of the Spanish economy they have to have these laws renegotiated,” crisis strategist Gonzalo Lira told RT. “These labor laws have to be reformed because they were written when thing were going great in Spain. And they are not obviously going great." Lira sees reforms and budget cuts as necessary measures for Spain if it “wants to continue on the path being a part of the eurozone." But protesters fear the actual effect will make the sacking of workers cheaper and quicker. They say that with the new legislation, bosses will be able to cut wages or change other working conditions just by citing concerns over profits. "This is a just response to a brutal reform of our system of labor relations," said Ignacio Fernandez Toxo, leader of the CCOO, one of the two main trade unions in Spain along with the UGT. Lira's prognoses on Spain are not optimistic. 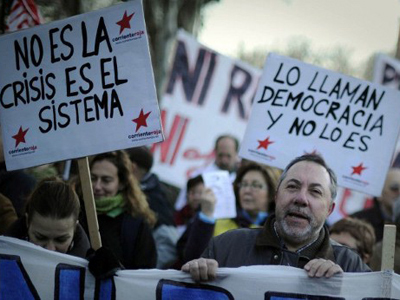 Nevertheless, many Spaniards are debating whether it is worthwhile to join Thursday’s strike. Walking out would cost them a lost day’s wage, while many salaries have already been cut or frozen due to the financial crisis. This, and a redundancy rate of 23 percent – a eurozone high – make people stick to their jobs closer than ever. 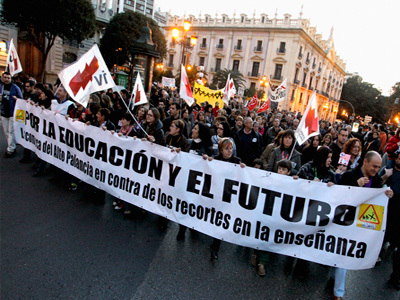 In Spain, over 5.3 million people are on the dole, half of them youngsters. 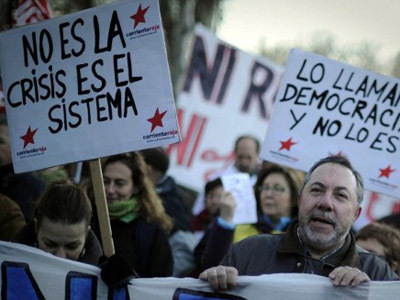 This is the first general strike against the government of Prime Minister Mariano Rajoy, who took office in December. The PM is said to have expected the labor reform to cost him a general strike, as Spanish media caught him saying on a hot microphone almost two months ago. The labor decree comes as one piece in a bunch of measures aimed to support Spain’s staggering economy. On Friday, Rajoy is set to announce the country’s budget, including a second package of austerity cuts. 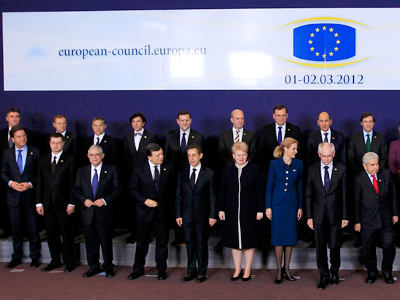 The previous reduction measures were some $20 billion (15 billion euro) worth, and new cuts are expected to be as huge. With the new round of belt-tightening, the government hopes to meet the requirements of the EU and other international investors in reducing Spain's deficit to 5.3 per cent of GDP this year, and to 3 per cent next year.